Today, our online identities are fragmented across an array of usernames, email addresses, screen names, social media accounts, passwords, and on and on. We struggle to remember our login info and passwords, so oftentimes we use a few simple passwords that are easy to remember, or find ourselves turning to hints or inboxes to remember our forgotten permutations. Of course, this can cause cracks in our security armor, especially when it comes to online transactions, leaving us vulnerable to online thieves and no-goodniks. Enter: OneID, a San Jose-based startup launching in beta today that is aiming to play a role in the next-generation of digital identity with a service that eliminates the need for multiple usernames and passwords. 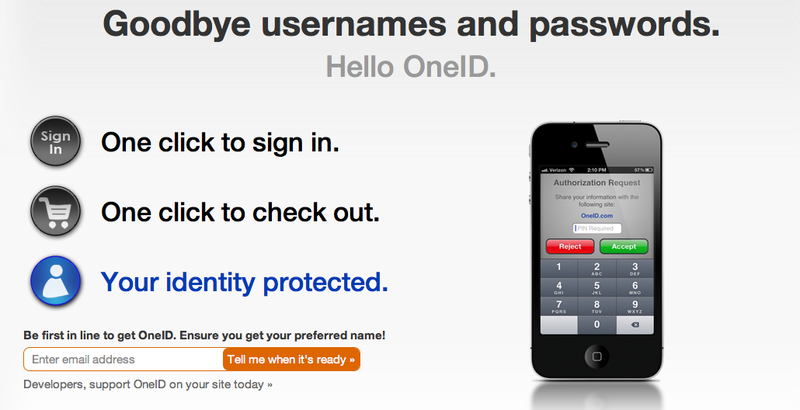 With OneID, users can securely log in to websites (across platforms), paying online with one single digital identity. Many have gone after the single sign-on holy grail, but as of yet, all have been rebuffed, because no one wants to hand over all their sensitive personal information to one company. According to the OneID team, its service is made possible by a combination of asymmetric cryptography, the maturity of mobile hardware/software (and their ubiquity), as well as a distributed architecture that collectively reduces business’ vulnerability to sophisticated online threats by merging the security keys of several personal devices, then encrypted in an amorphous mass in a data center. In short, it’s an all-out, world-changing infrastructure play, and although it’s got a steep hill to climb, the company will remain one to watch based on its leadership alone. The startup was founded by Steve Kirsch, a wealthy serial entrepreneur, who has founded six companies, including Mouse Systems, Frame Technology, Infoseek, Propel, Abaca, and OneID. Beyond Infoseek, which Kirsch sold to for a reported $1.7 billion, he is one of the co-inventors of (and holds one of the original patents to) an early version of the optical mouse, which behind Kirsch’s vehicle Mouse Systems, helped bring the optical mouse to IBM PCs. Along with engineers Jim Fenton, Adam Back, and Bobby Beckmann, who co-created the technology behind OneID, Kirsch is going after the big fish: Integrating OneID’s technology into sites across the Web to let users create their own uniform digital identities, using the distributed software to both house payment information and for form-filling requirements. As such, OneID’s identity software runs in four places — browsers, mobile devices, websites, and the cloud. Again, for businesses, this means reducing the IT costs inherent to authentication and financial transactions, like lost password recovery, chargebacks, liability from credit card theft, the need to store credit card information on their servers, and, thanks to speeding up sign in and check out shopping, reduces cart abandonment. And for consumers, their credit card and personal information is stored on their personal devices using OneID’s software, which means it won’t be exposed in the event of a central security breach. Users can also choose the level of security they want for each type of transaction, allowing them to balance security with convenience at their discretion. Of course, many companies have barked up the next-gen secure identity software tree before, to no avail. However, OneID already has several companies lined up to integrate the identity and payment technology, among then Salsa Labs, which offers payment and marketing services for 2,000 nonprofits organizations. For more on OneID, check them out at home here.